Periodontal disease, commonly known as gum disease, is an infection of dental tissues. The disease comes in two forms, periodontitis and gingivitis, and is caused by poor brushing and flossing habits that foster the growth of bacteria. 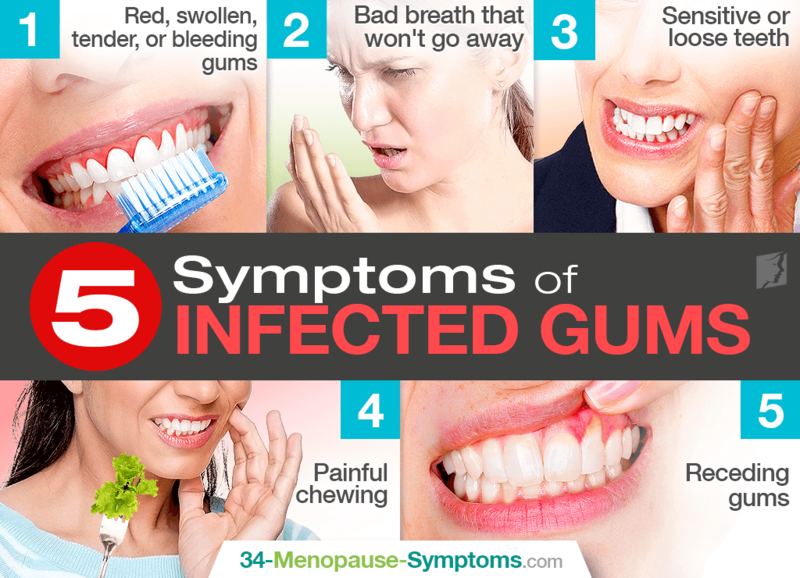 Gum infection symptoms can be exacerbated by hormonal changes that take place in the reproductive lives of women, including perimenopause. Continue reading to learn more about symptoms of a gum infection and what you can do to get your healthy smile back. Gums around the base of your teeth (gingiva) that show signs of inflammation - red, swollen, and bleeding after brushing or flossing - are one of the first symptoms of having the mildest form of periodontal disease, called gingivitis. If gingivitis is left untreated, it can develop into periodontitis as the tissues and bones that support the teeth become affected. Persistent bad breath, known as halitosis, is a symptom of periodontitis due to a buildup of toxins produced from the bacteria in your mouth. These bacteria break down pieces of food stuck between teeth and then release unpleasant-smelling gas. Pockets around the teeth become deeper during more advanced stages of periodontitis, leading to loose teeth and, eventually, tooth loss. Using a tiny ruler called a “probe” can measure pocket depth around the teeth. In a healthy mouth, pockets measure between 1 to 3 millimeters in depth; whereas, unhealthy pockets can go as deep as 12 millimeters. This symptom of gum infection also generally occurs in more advanced progressions of periodontitis. Teeth have loosened due to having deeper pockets, in which pus can form between the teeth and gums, making eating difficult and unenjoyable. In advanced cases of periodontal disease, gum inflammation can eventually cause pockets to develop that fill with bacteria, tartar, and plaque. If not treated, the pockets keep growing in size and fill with more and more bacteria. This can cause an ultimate loss of bone and tissue, as in the case of receding gums. What Do I Do If I Have Gum Infection Symptoms? The main goal of treatment is to control the infection, and treatment depends upon how advanced the symptoms of gum infection are. For example, the early stages of gingivitis is reversible by brushing daily twice a day, flossing daily, and regularly visiting dentist or dental hygienist for cleanings. In more advanced cases, you will need a deep-cleaning to remove bacteria below the gum line or antibiotic medications, gels, or mouth rinses. Surgery will be required to restore bone in the most severe of instances. It is important for menopausal women suffering from gum infection symptoms to pursue necessary treatment for the disease as well as the underlying cause of the condition, hormonal imbalance. Gum problem treatments start off with lifestyle changes that include an optimized diet rich in calcium, vitamin A, and vitamin C as well as alternative medicines proven to support hormonal health. The Brown Reference Group. (2008). Diseases and Disorders, Volume 2. New York: Marshall Cavendish Corporation. Available from Google Books.